Intel - APP3HSDBKIT INTEL - HOT SWAP DRIVE BRACKET MOUNT KIT FOR SC5295/SC5650 SERVER CHASSIS (APP3HSDBKIT). NEW.IN STOCK.SHIP SAME DAY. 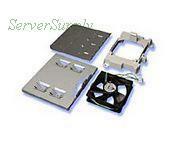 Intel - C55969-004 INTEL - SR2400 SERVER CHASSIS KIT (C55969-004). NEW. IN STOCK. SHIP SAME DAY. Intel - A2400SCSIKIT INTEL - SR2400 SERVER CHASSIS KIT (A2400SCSIKIT). NEW. IN STOCK.SHIP SAME DAY. Generic - Solderless Standard Density RGB Color Change LED These standard density RGB color changing LED strip kits are designed to make installing LEDs easy. The kit includes everything you need to install and use the LED strips and even includes a remote.